From coast to coast across the United States, Catholic journalists have spoken to people who remember and have been inspired by meeting Blessed Teresa of Kolkata, who will be declared a saint by Pope Francis Sept. 4. Read eight stories of remembrance from Catholic News Service — and don’t miss similar reflections by local Catholics in the Archdiocese of Philadelphia, as well as a photo gallery from Mother Teresa’s visits to Philadelphia. ST. CLOUD, Minn. (CNS) — For Patrick Norton, a member of St. Joseph Parish in St. Joseph, Minnesota, his relationship with Blessed Teresa of Kolkata dates to 1962 when he was born on the streets of Bombay (now Mumbai), India. Abandoned by the side of the road, he was rescued by the Missionaries of Charity, a congregation founded by Mother Teresa in 1950. He was taken to St. Joseph’s Nursery where he remained until age 7, when he was sent to Our Lady’s Home, a Catholic orphanage also founded by Mother Teresa. In 1964, Pope Paul VI visited the orphanage and the news of it spread across the world. People began inquiring about the children there, including John and Marjorie Norton, a couple from Connecticut. The Nortons requested to adopt two children from the orphanage — one was Patrick, then 15; the second, a younger boy named Martin. The two boys joined the already large Norton family, which included nine biological children and three other adopted children. In the U.S., Norton grew up in a wealthy family. His father was a well-known judge but died only eight years after the adoption. In that short time, the two became very close. Norton’s mother noticed that he was struggling with the loss of his father and suggested he visit Medjugorje, Bosnia-Herzegovina, where Mary reportedly has appeared for nearly 40 years. There he met a Minnesota native, Sandy Schindler. The two kept in contact when they returned to their homes and eventually began dating. This year they celebrated 25 years of marriage and have three children. When Norton, a self-employed painter, learned of the canonization of Mother Teresa, whom he believes may even have picked him up from the street herself, he knew he couldn’t afford the costs of traveling to Rome. While attending daily Mass at another parish one day, Norton heard the priest ask members of the congregation to pray their intentions aloud. Weeks later, Norton received a phone call from an anonymous benefactor who offered to pay for him and his family to fly to Rome. With the help of the Missionaries of Charity he received tickets to the canonization Mass and also plans to attend Pope Francis’ general audience Sept. 7. 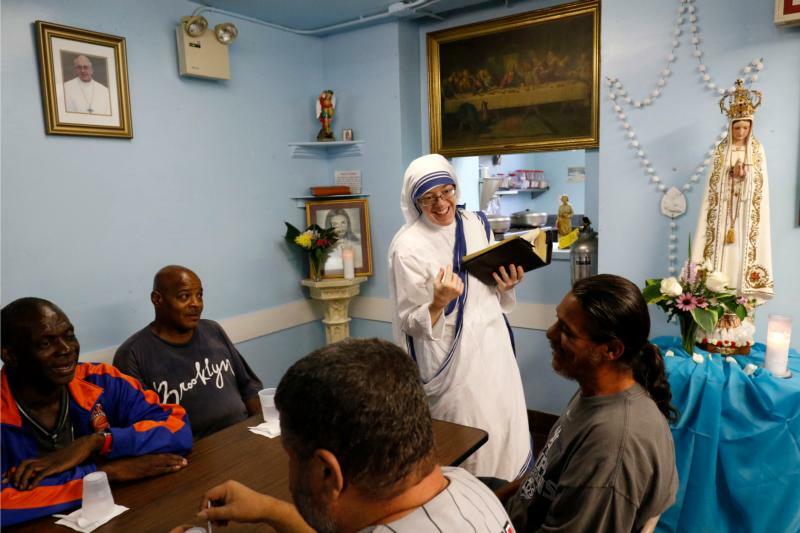 NEW YORK (CNS) — Nestled in the Mott Haven section of the South Bronx is St. Rita’s Convent, home now to 20 Missionaries of Charity and a residence for their founder St. Teresa of Kolkata when she visited the United States. Mother Teresa selected the convent for the sisters to serve poor people in the neighborhood. The convent, which also serves as the order’s North American Regional House for Eastern United States and Eastern Canada, was filled with excitement in anticipation of Mother Teresa’s canonization Sept. 4. “This is the Year of Mercy, and we’ve been waiting a long time thinking, ‘Why is it taking so long for our mother to be canonized?’ The Lord had a plan to have it come in the Year of Mercy,” Sister Mary Clare, assistant to the superior for the Missionaries of Charity at St. Rita, told Catholic New York, newspaper of the New York Archdiocese. Sister Clare can share many stories of Mother Teresa’s visits, including a human side displayed in her sense of humor and sweet tooth for ice cream, chocolate and candy. Sister Clare also shares the joy the sisters have to serve the poor as they continue to live a simple life set forth by their founder. The sisters live in a brick building with a banner of the U.S. Postal Service postage stamp honoring Mother Teresa hanging outside the front of the home facing a housing project. The sisters live without computers and wash their clothes by hand. They avoid pageantry for the good they do, rarely granting interviews or permitting media to enter the convent. For nearly three decades, Sister Hesed was a member of the Missionaries of Charity and worked with the order’s founder, Mother Teresa. A native of Canada, Sister Hesed was a member of the Sisters Adorers of the Precious Blood when she traveled to New York to meet Mother Teresa to discern her vocation with the Missionaries of Charity. In 1976, Sister Hesed became the first candidate of the Missionaries of Charity Contemplatives in New York, working under Mother Teresa for 27 years. Following continued discernment, Sister Hesed sought out another order of women religious. In 2006, the Sacred Congregation for Religious in Rome permitted her to transfer her vows from the Missionaries of Charity Contemplative to the Society of Our Lady of the Most Holy Trinity. Sister Hesed moved to Willey in 2012, where she established Domus Trinitatis, Home of the Trinity, a spiritual retreat and renewal center. Sister Hesed was to be among the hundreds of thousands of people present for the canonization ceremony Sept. 4 in Rome. “It is, in a sense, Mother inviting me to be present and witness something that I heard her say so, so, so often: ‘Holiness is not the luxury of the few but a simple duty for you and for me,'” she said. “It is a time of ‘drinking deeply’ at the fountain of grace offered not only during her canonization but combined with the Year of Mercy. It is a true spiritual journey, not only in the heart of the Catholic Church, but also at the feet of the one I called ‘Mother’ for 27 years. MURFREESBORO, Tenn. (CNS) — Bonnie Tinsley and her husband Cliff Richeson were living in India in the mid-1980s when a vacation detour brought them to the Darjeeling Shanta Bhavan Missionaries of Charity orphanage, where they saw, tucked away in a corner crib, a baby girl. “It was love at first sight,” Tinsley said. The couple immediately knew they wanted to adopt the child, but had no idea of the challenges that lay ahead, or that a personal encounter with Blessed Teresa of Kolkata would finally make the adoption possible. Tinsley and Richeson were American and not Catholic. In addition, Tinsley previously had been divorced, offering a less than ideal biography for adopting a child from a Missionaries of Charity orphanage. The order primarily worked with adoption agencies in a few European countries to facilitate adoptions with Catholic families; they rarely worked with Americans, even those living in India. At the time, Tinsley and Richeson were trying to adopt the baby girl, many of the babies, including their future daughter, had been abandoned in the hospital by their birth mothers, and were soon adopted by Catholic families in Belgium, Italy and France. When the couple started the adoption process, they faced a “mountain of paperwork,” according to Tinsley, as well as interviews and negotiations with the Indian government, the U.S. government, and the Catholic Church. They encountered roadblocks and refusals for more than a year before they took their message directly to Mother Teresa. 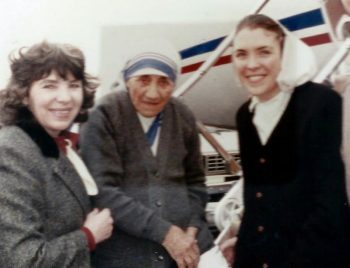 It was a staff member of the U.S. consulate in the city then known as Calcutta who told them to go to the Missionaries of Charity motherhouse, where Mother Teresa would be praying vespers. Off they went, only to be greeted by a wall of tourists trying to get in. Mother Teresa told them, “I have said no to so many Americans, I’m not sure it’s fair if I say yes to you.” She told them she must pray about it, and they should, too. She told them to return in the morning. The next day, there was a paper waiting for them, signed by Mother Teresa, that they were to take to the orphanage, granting permission for them to adopt the baby girl. Arrangements were made for the girl to be moved to another orphanage that would facilitate American adoptions. LOUISVILLE, Ky. (CNS) — The sick lie moaning on cots as volunteers caress and comfort them, dressing wounds or inserting needles for intravenous feeding. The patients are divided by gender — men on one side, women on the other. On one side, a man seems very ill. He eventually succumbs to death and is respectfully covered and quietly removed from the room. Nearby, three or four Missionaries of Charity are busy preparing lunch over the fire. A haze from the fire hangs in the air. Meanwhile, Blessed Teresa of Kolkata takes her time visiting patients one by one. On Dec. 7, 1981, Father Patrick Delahanty witnessed and photographed the scene at a home for the dying established by Mother Teresa in the Kolkata neighborhood of Kalighat. He wrote about the encounter in his travel diary later that day. Father Delahanty, a retired priest of the Louisville Archdiocese and an avid photographer, was one of several people who shadowed Mother Teresa and the Missionaries of Charity for a couple of weeks in 1981. They produced a film, “Work of Love,” and a book, “Words to Love By … Mother Teresa” based on what they saw. Father Delahanty’s photos appeared in the book published in 1982. It took a while for Mother Teresa to agree to the project, consenting only when she was convinced the project wasn’t just about her, but rather about the Missionaries of Charity, their work and their spirituality, he said during a recent interview. Father Delahanty captured meditative portraits of Mother Teresa and snapped candid shots as she walked Kolkata’s streets. He also photographed other Missionaries of Charity and the people of Kolkata from children lined up to receive food and medicine to cobblers piecing together shoes in the streets. His diary described a constant haze of yellowish smog in the air and a feeling that, try as you might, “you can’t get clean.” He told of a constant flow of people bathing in city fountains. Mother Teresa’s facilities — an orphanage, a school and homes for the dying and people with Hansen’s disease — were extremely clean in contrast, he said. BAILEYS HARBOR, Wis. (CNS) — A lot of people planned to be glued to a television Sept. 4 when Blessed Teresa of Kolkata is canonized in a Vatican ceremony, including her onetime chauffeur. Mother Mary Catherine, founder of the Missionaries of the Word based in Baileys Harbor, spent 10 years with the Missionaries of Charity working in many capacities, including as Mother Teresa’s chauffeur. “The year before I was to take final vows, they sent me home because I have asthma,” she told The Compass in 2014, the year she professed her final vows and became Mother Catherine. Mother Mary Catherine, formerly Peggy Duemling, was 24 when she met Mother Teresa in 1986 in the South Bronx. That first impression of her never changed: simplicity and a single-hearted focus on Jesus. “That was the core of Mother,” Mother Mary Catherine said. “Everything with Mother came down to the five fingers on her right hand, one word for each, a summation of Matthew 25: You did it to me. Driving Mother Teresa when she visited were special times. Mother Mary Catherine always felt she was in the presence of a very holy person. And it left her a little tongue-tied, so to speak. “I can recall Mother sitting next to me in the van while I was driving, and Mother was not able to get her seatbelt into the shaft to lock it in place,” Mother Mary Catherine recalled. “I was just a postulant, had been in the order for maybe eight months, and I wasn’t sure if I should help her or wait or what. I just felt so small spiritually next to Mother. 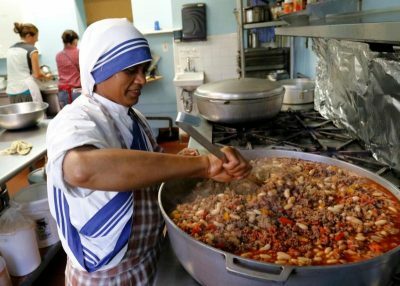 SAN FRANCISCO (CNS) — When the 13 sisters of the Missionaries of Charity convent in Pacifica arrive by bus at St. Mary’s Cathedral on Sept. 4 for a Mass celebrating the canonization of Blessed Teresa of Kolkata, some of the homeless and poor people they minister will be on board with them. “We’ve been working on inviting migrant families, young people and others to join us in pilgrimage to Holy Doors at the cathedral and attend the thanksgiving Mass,” said Sister Maria Concepcion, superior of the convent. The families include members of Our Lady of Refuge Mission in La Honda and St. Anthony Mission in Pescadero. The Pacifica convent is headquarters for the Western Province of the Missionaries of Charity on the grounds of Good Shepherd parish. The sisters’ outreach includes an AIDS hospice, a home for unwed mothers and the novitiate for all the Americas. The sisters also feed and minister to the homeless in San Francisco. 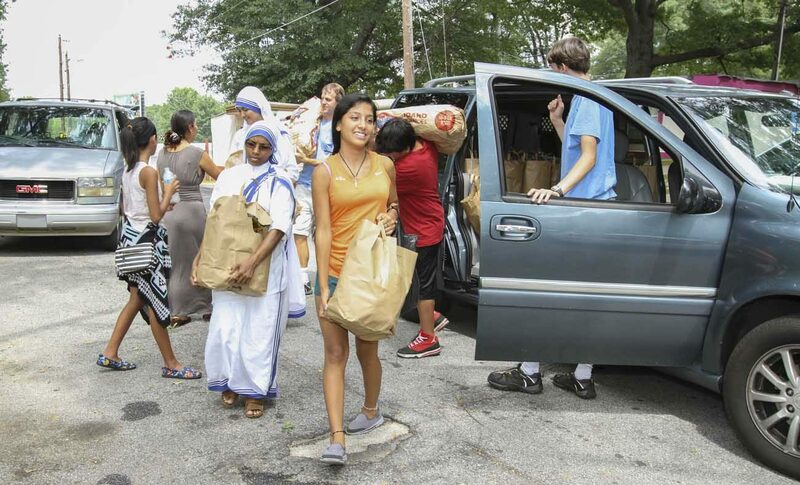 ATLANTA (CNS) — For Maria Diaz, the Gift of Grace House has been home for six years. 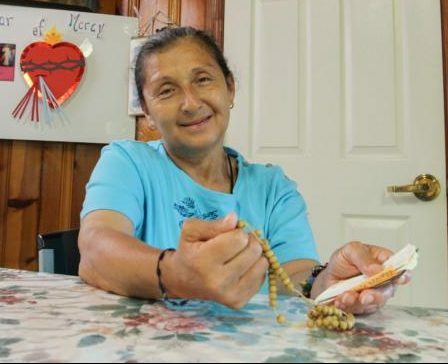 The native of San Salvador, El Salvador, is unsure how long she lived on Atlanta’s streets or when she even arrived at the home run by the Missionaries of Charity for indigent women with AIDS. After years of being involved in drugs, alcohol and prostitution, she learned of Gift of Grace House through a social worker while hospitalized at Atlanta Medical Center. Diaz, 56, had not heard of Jesus before finding Gift of Grace House. “God changed my life. He gave me a new heart,” Diaz said. The sisters taught her the mysteries of the rosary. “They showed me to pray the rosary,” she said. Diaz shows several scraps of folded, worn paper with scores of names. They are the people she prays for daily. “She’s our prayer warrior,” said Sister Leo Grace, a member of the Missionaries of Charity. The past was a “nasty life,” in which “Diablo,” the devil, worked for her soul, Diaz said. God gave her the Missionaries of Charity to show her the way to live. “He picked me up out of the trash. He gave me a second chance in my life,” she said. Diaz quit smoking three years ago and loves to help with cleaning tasks. She offers her work to God and excitedly shows her new broom and dustpan. Diaz said she now has compassion for others. 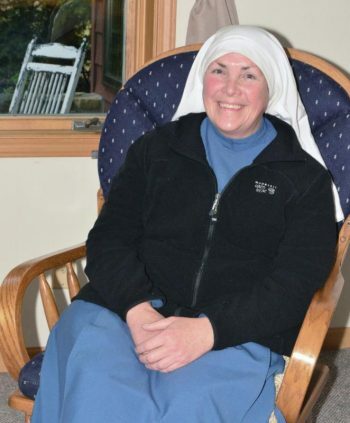 She hopes the public will support the Missionaries of Charity who serve as their foundress did. No matter how busy, everyone can give something to God. “You have five minutes,” Diaz said. Contributing to this report were Kristi Anderson, multimedia reporter at The Visitor, newspaper of the Diocese of St. Cloud, Minnesota; Dan Pietrafesa, who writes for Catholic New York, newspaper of the Archdiocese of New York; Joanne Fox, managing editor of The Catholic Globe, newspaper of the Diocese of Sioux City, Iowa; Theresa Laurence, staff writer at the Tennessee Register, newspaper of Diocese of Nashville; Marnie McAllister, editor of The Record, newspaper of the Archdiocese of Louisville, Kentucky; Monica Sawyn, who writes for The Compass, newspaper of the Diocese of Green Bay, Wisconsin; Christina Gray, a staff member of Catholic San Francisco, newspaper of the Archdiocese of San Francisco; and Nichole Golden, staff reporter at The Georgia Bulletin, newspaper of the Archdiocese of Atlanta.